After enjoying the refreshing taste of Coca-Cola, we always tend to discard or throw away those empty pet bottles. We all know that pet bottles are recyclable and many have used them as containers. However, designers from Emeco come up with a different idea, thus a different product from the same supposed to be discarded product, the empty coca-cola pet bottles. 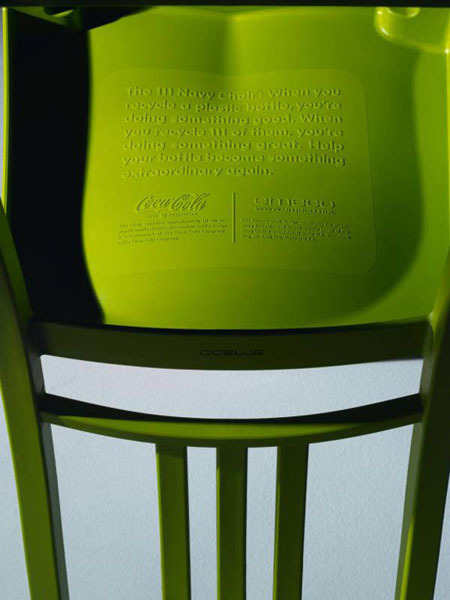 People from Emeco had created the 111 Navy Char, wherein as the name suggest, it is made from 111 Coca-Cola empty pet bottles. Looking at the photos of the chair, they look like made of first hand materials. With this product, drinking lots and lots of coca-cola can now bring good to the environment.